I have been sharing many outfit looks with the fabulous jewelry my sister and I created on my fashion blog redsolesandredwine.com. 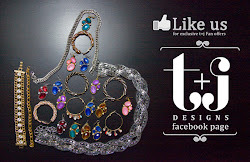 We are so excited to launch t+j designs blog and here is a compilation of some ideas of how wearable our jewelry can be! Day or night, these necklaces go with everything and add that sparkle to every outfit. Our goal is to provide you with beautiful fashion jewelry that is easy to wear at a great price. My sister and I love the mix of the the chain links with crystal rhinestones and we are seeing this trend in the fashion reports! I am so excited to finally see your new Jewelry Line. I truly love and want everything. I am an avid follower of both of your personal blogs and have now added this blog to my fave list. I'd love for you to check out my blog as well. Best of luck with your new line and I look forward to purchasing some pieces for myself! So adorable! The crystal rhinestones necklace is just perfect for displaying the outfits. Love the bling!